Caroline Black, fifteen and a straight-A student, longs for and fears a world beyond tests and grades. Born into a film-industry family, feeling like a misfit, Caroline transfers from the exclusive Laurel Academy for Girls to her local public high school, Hollywood High. She finds gangs, over forty native languages, teen prostitution and extreme violence targeting the LGBT community. The novel traces Caroline's group of friends' dawning awareness of homophobia in themselves and their community, as they navigate paths to becoming LGBT allies.Through the school year, Caroline discovers friendships and a rich diversity that allow her to thrive in ways she never imagined. 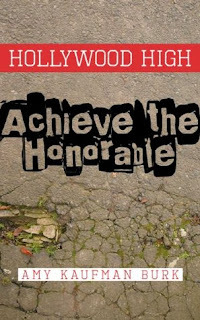 When I read the sample of Hollywood High: Achieve the Honorable online, I was hooked. I needed to know what would happen with Caroline. Amy Kaufman Burk’s novel seemed like a completely different story than I had ever seen before and that intrigued me. There were a few things that bothered me about the book and those things kept me from giving the novel a higher rating. The issues were mainly with technical things – phrasing, flow, and timeline. Caroline is a very proper teenager and that comes through in her speech. I would have been ok with just that but sometimes other parts, descriptions and so on, were also too proper, too formal. Regarding the timeline, there were times I was very confused about when things took place and in what order. There were flashbacks but they weren’t done in a consistent way so I wasn’t always sure when I was back in time. Burk also withheld some information until the end of the book so we didn’t have the full story. I could understand keeping the big secret a, well, secret but there were other things that were revealed in a slow way that didn’t need to be. Finally, the flow was off in a few places where you’d get a snippet of an event, then you’d go back in time and work towards that previously mentioned snippet. This is sort of a timeline issue too but the way it was written was jarring. The flow being off meant I wasn’t able to enjoy the story as much as I’d like. And I did enjoy the story. It was tough to read in some spots as there was a lot of violence, drugs, and prostitution. It’s not easy to read about kids having to deal with these issues. I wouldn’t say Burk takes some things too far but there were a few scenes that had me covering my mouth because I was horrified at thinking of teenagers dealing with such violence and judgmental peers. Even with those tough scenes, I’m glad Burk told this story. We think bullying is a new thing, especially with the way it’s been talked about in the news lately, but it’s not. Kids have always judged their classmates and there have always been altercations. Instead of mostly physical fights like in this book, bullying now includes virtual fights. I think the teens in this book handled themselves pretty well (if a little too perfectly sometimes) and they all learned a lot from each other about beliefs and what’s right or wrong. That was great to read about. There were a lot of characters in this book and that was both a positive and a negative. I got confused a few times because I couldn’t keep some of the characters straight (especially the adults) and there wasn’t enough development in some characters and too much in others that we didn’t see (Kayla, for example, seemed to completely change and I don’t really know why or how that happened). But, by having so many characters, Burk was able to showcase the diversity at Hollywood High and show what kinds of people Caroline was dealing with. For example, The Duke, the boy Caroline tutors, was a leader of a gang but there was more to him than meets the eye and Valerie, a friend from Caroline’s old school, seemed to have a perfect life but she had a big secret. Those are just two examples but the characters were very diverse and it did work with the story to show every side to every situation. 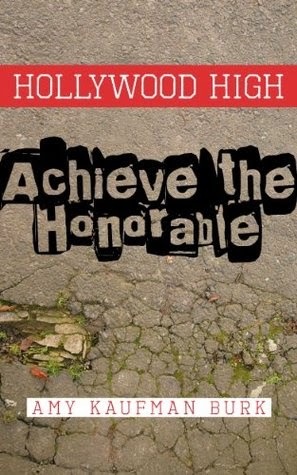 Overall, Hollywood High: Achieve the Honorable by Amy Kaufman Burk was a pretty good read. It was unfortunate that the technical issues took away from my enjoyment somewhat but I still think there’s a solid story here. While this book took place in the ‘70s, it’s sad to think that there are teens and adults out there who are still so extremely prejudiced and racist and that bullying is still a huge issue in school. Here’s hoping for some big changes to the world, and soon. Thank you to Amy Kaufman Burk for our review copy. All opinions are our own.